This is PART 2 in a series of training videos for the United Electric Controls One Series Safety Transmitter. The One Series Safety Transmitter is a pressure or temperature monitoring transmitter switch that provides a NAMUR NE 43 standard 4-20 mA analog output. Its programmable high-capacity solid-state safety relay output enables the fastest emergency shutdowns. The One Series Safety Transmitter is certified for use in SIL 2 functional safety applications (HFT = 0), and is capable of SIL 3 applications when augmented by redundancy and voting logic. Its simple design means fewer nuisance trips — for greater safety, productivity, and throughput. 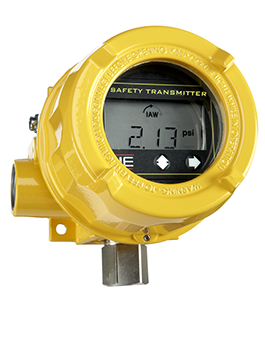 The One Series Safety Transmitter was designed with features that simplify installation, improve productivity, and eliminate nuisance trips. “I Am Working” sensor diagnostics with redundant data processing detect open, shorted, and plugged sensing elements. The transmitter’s analog output conforms to the NAMUR NE 43 standard and provides process variable (PV) and detected-fault information. Discrete outputs provide a fail-safe (open) emergency shutdown when a fault is detected. Set point and deadband (reset point) are 100% programmable. The instrument is password protected to prevent unwanted parameter changes; eliminating the risk of tampering. In addition, LED backlighting enhances viewing of process variables, parameters, and status in dimly lit areas.